If your business has processes where the signature of a document by different parties is required, integrate our service so you could quickly and safely automate your contract process. You will have an accreditation certificate including all information about every operation. Logalty’s electronic signature is the legal and technological solution that creates a better environment of trust and legal certainty when using telematic means, apart from enabling to close the circle of electronic contracts without papers. Use it with your clients and suppliers throughout the world. Start saving costs, resources and time, compared to other traditional methods. SEPA adjustment within the eurozone, since it entered into force on February 1st 2014, represents a daunting challenge for organizations, especially those which receive payment for its services by direct debit, when facing the accreditation of their debtor´s consent to bill the charges. Not only it is required the adjustment in compliance with the European Regulation 260/2012, but also adjusting to it, reduces the risk of default from 13 months to 8 weeks (SEPA Core or Basic System among companies, private individuals and self-employed) or even only to 2 days (SEPA B2B or Business System among companies and self-employed). Logalty Certified Accreditation service provides with a solution with full legal validity and technical safety over the process of e-mandates collection, which allow their online formalization, according to the highest level of regulation compliance, legal strength, flexibility and technical safety within the market. Allow your debtors to sign using the most convenient means, enabling them the use of digital ID’s, their electronic Identification numbers, a signing PIN received by SMS or Voice, or even a key-stroke biometric signature in a Tablet device, whilst constantly complying with the Spanish Law on Electronic Signature 59/2003, of December 19th, and the Spanish Law on Information Society Services and E-Commerce 34/2002, of July 11th. Logalty renders services of signing documents online to multi-channel distribution models. Due to our deep commitment to technological innovation, we have implemented as a means of signing to your current portfolio, the DNIe (Spanish electronic national ID) electronic signature system thanks to the new 3.0 version, which now includes NFC wireless technology. This new signing system based on mobility allows you to use the e-signature recognised by the user’s mobile phone, using the DNIe 3.0 certificate. 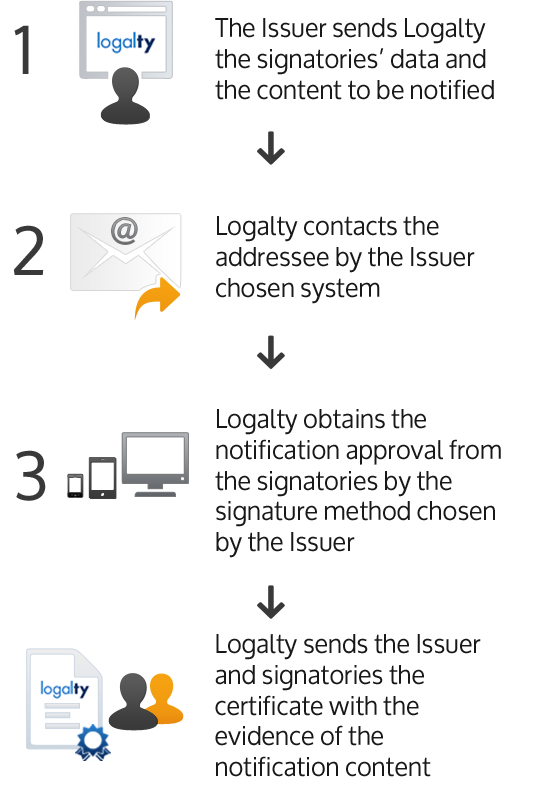 Thus, Logalty joins in its signature process: identification, e-signature and mobility.